Update: I'm still loving a backpack diaper bag, but I upgraded to this LAND backpack and it changed my life. So organized. So compact (yet spacious... how?!). Definitely recommend it! The diaper bag. 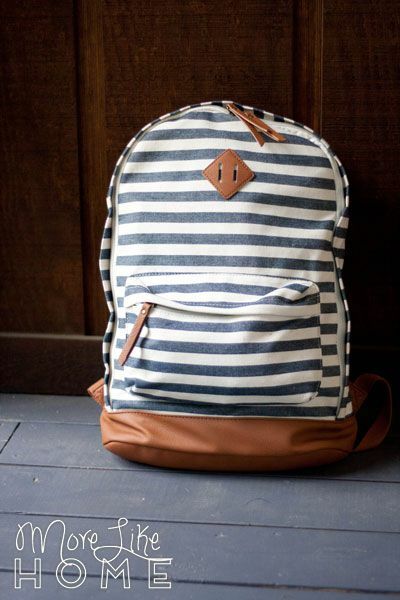 It's no fun to lug around, but you don't want to be caught without it. 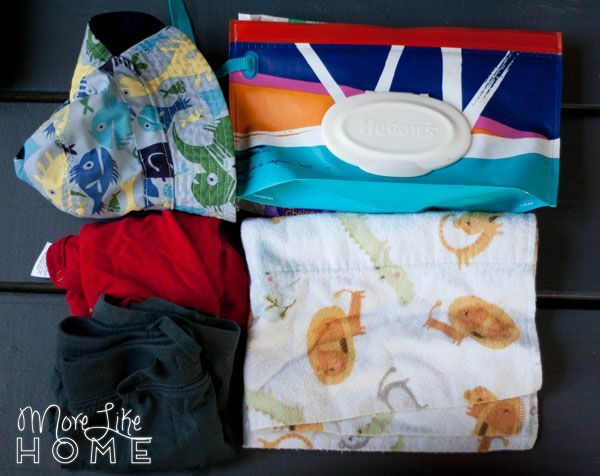 So we do the best we can to make our diaper bag work for us, not slow us down. But this season of life has us ditching the traditional diaper bag and reaching for something a little different - a backpack! With three little boys to corral, I need my hands free as much as possible! Even having our messenger-style Stroller Friendly Diaper Bag swinging around has frustrated me. The last straw was a hike down to a creek at a local park. When it was time to leave, the boys pulled the old "my legs are too tired! I can't walk!" and left us dragging three children and an unruly bag all the way back up the hill. That was the moment I decided to go backpack shopping. So today I thought I'd shared a quick peek inside our pack at what carry in it for our 5 year old, 3 year old, and 10 month old. This backpack is from Target and has one small zipper pocket inside and one outside. So let's start with the outside pocket! 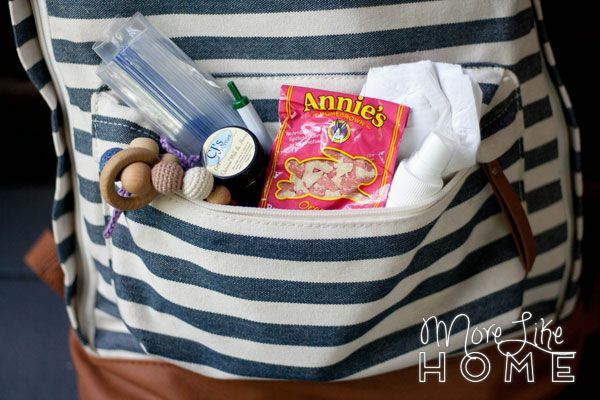 We keep the smaller things we don't want to search for in here: a teething ring, small CJ's BUTTer diaper cream, tissues, a pen, ziploc bags for boys to collect treasures in, bug spray, and a couple small snacks. Inside is one large compartment. One of my favorite things about this bag is that the zippers can pull all the way down to open the front of the bag, so it's easy to find things even at the bottom. We carry two sizes of diapers, wipes, and for the baby a change of clothes, sun hat, and burp cloth. 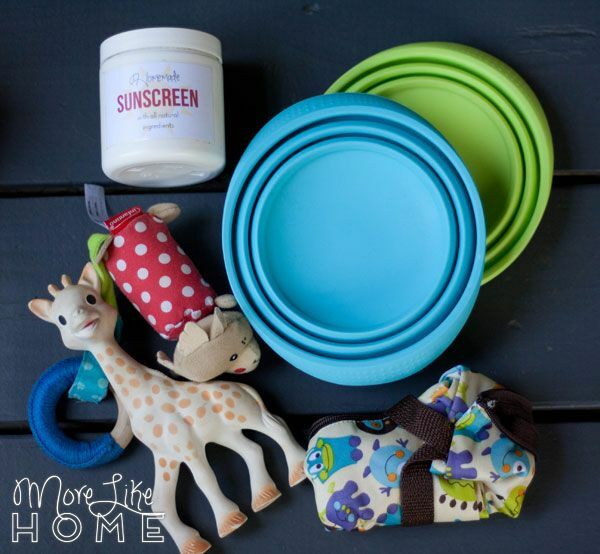 Plus sunscreen, a few small toys, a wet bag, collapsible bowls for the big boys (great for snacks & playing with! ), and a sippy cup (that didn't make the pictures). I usually keep a water bottle and our shorty wrap with a slingring in the backpack, too. 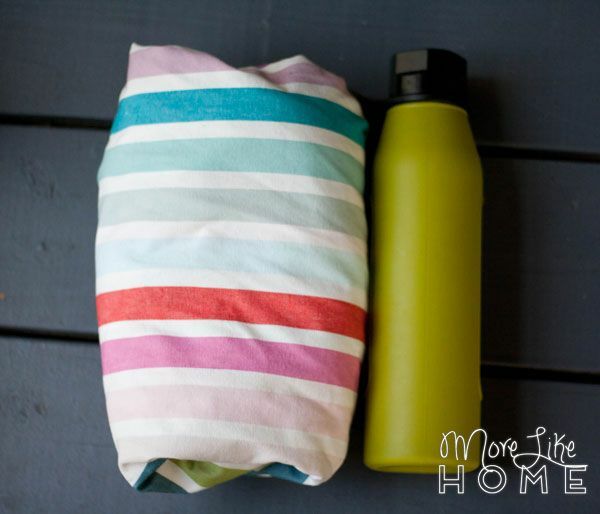 Besides being a great on-the-go wrap, our shorty also makes a great park blanket and nursing cover. It fills a lot of rolls without taking up too much space in the bag. 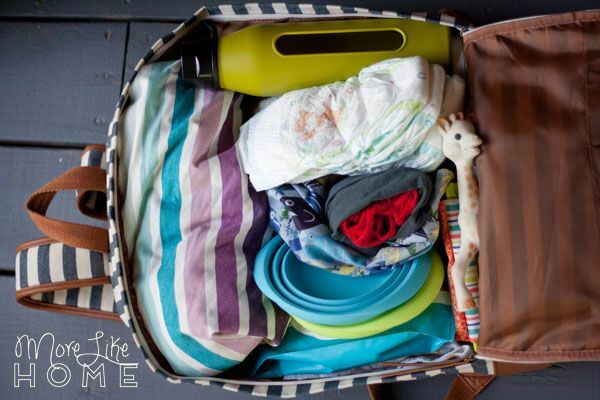 That's all we carry in the diaper bag, but we also keep an "emergency tote" in our van with other things we might need (more on that coming soon). So this is just stuff we're more likely to need on hand when we're out for a few hours. We also have a stroller tote (tutorial here) we can keep clipped on the back of our stroller for the convenience of our convertible stroller bag without having to carry it all the time. That's a big win! Want more organizing goodness? Check out how we keep our stroller handy (without taking up floor space in the van) and the rest of our mini-van organization! What diaper bag do you like? What do you pack in it? What is the brand of this baby? I'd love a li k if you have one. I love this full front zip bag. It's a Mossimo backpack from Target. I *think* this is the same bag in the new print, but that's just based on the website pictures so I can't say for sure if it's the same size. DIY Mini Van Stroller... Holster?